This predator is hunting upon the flower head of a Desert Marigold. In this case it is harming slightly the plant by deterring pollinators. Assassin bugs of many kinds are found in the Sonoran Desert and are generalized predators taking caterpillars and other mostly soft-bodied prey. Gardeners should encourage these insects by eliminating chemical pesticides and leaving some weedy vegetation in border areas. This common species uses an interesting technique for capturing prey: the tibiae on the first pair of legs are coated with sticky glue which helps hold prey while the sharp beak penetrates and delivers salivary poison. 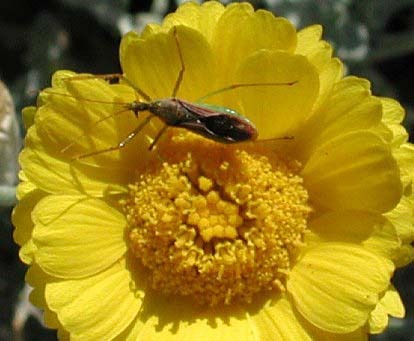 If handled carelessly, reduviid bugs can deliver a painful bite.